Adam "Legs" Gorlitsky is now considered an expert at fundraising and even uses his charity, I GOT LEGS, to help others work toward fundraising for mobility equipment. 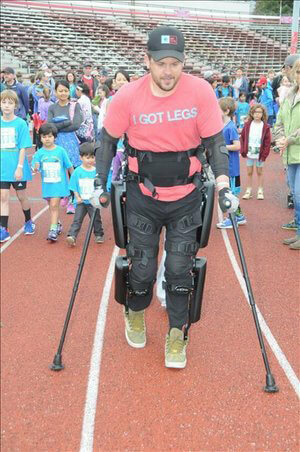 Legs started his fundraising journey two years ago when he asked for help to afford a ReWalk Exoskeleton-a robotic brace that allows a paraplegic, like Adam, the opportunity to walk again. It wasn't a small endeavor: one brace costs in the neighborhood of $95,000. "I couldn't wait to get back out there. With any physical disability, you feel a little trapped in a way. Your freedom is taken from you," Legs said. Legs was hurt 12 years ago. "When you first get hurt, obviously it's a punch in the gut," he said. The casual way he said it sounded like a minor inconvenience rather than a life-changing injury. But, then again, to Adam and his exoskeleton and MXV, nothing is impossible and nothing is unattainable. "There's so much stuff out there now on social media. To really capture people's attention, you have to post non-stop on your [platforms]," Legs said. 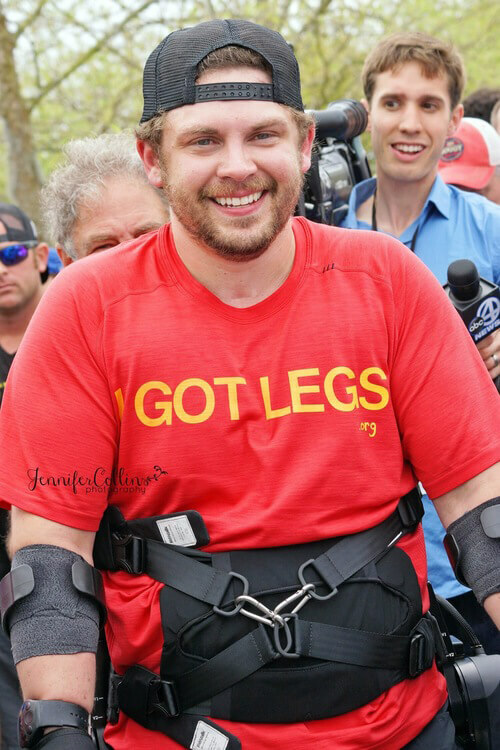 He created a campaign around his progress when training with the exoskeleton and educated would-be donors about the purpose of the "legs." The adage "Divide and Conquer" was a mantra for Legs, who thought he could meet his fundraising goals in time on GoFundMe but wanted a more concentrated effort. Not one to sit back and wait, he created his own "I GOT LEGS" t-shirts, which even made their way to celebrities, such as Stephen Colbert. "I knew I was going to create an organization around this exoskeleton," Legs said. Teaching others about your vision for when you achieve your goal is important, not just to persuade people to donate but it also helps to keep you accountable. If you don't want to create and manage a company, that's okay, says Legs. Altruism doesn't stop at a macro level. "Do it for yourself, but do it for someone you really care about," he said. Do it not just to enrich your life, but someone else's too. "In order to ask for help, you have to be vulnerable. I think people are too scared to put themselves out there in a vulnerable way," Legs said. He said that he had to learn how to openly share his full story. Though he wasn't necessarily comfortable with it, Legs knew that he couldn't reach his fundraising milestone on his own. So, sacrifice on his part was necessary to help him get there. "It's not normal to be scared to go out in the world and reclaim your previous life," Legs said. "It also allows the person who is in training on their exoskeleton and other leg brace technologies to earn back their 'legs' on the road," said Legs. Once the money has been raised, participants in Step Tours don't have to stop. Adam says that they can pinpoint other things which would enhance the accessibility in their lives or community (such as a ramp to their house or an accessible beach ramp). "To be honest, all these ideas come to me when I'm riding my handcycle or when I'm driving in my MXV," Legs said. "Driving is like the one place where everything kind of makes sense." "Driving is like the one place where everything kind of makes sense." Legs knew what kind of car he needed but wasn't sure he could find the dream car that he'd built in his head. A minivan, the standard wheelchair accessible vehicle, wasn't an option for him. "Everything I own-my shoes, my shirt-is all a form of self-expression. I wanted a car that reflected who I was too," he said. "I had to find a car that not only matched what my personality was but accommodated my chair, too." "Everything I own-my shoes, my shirt-is all a form of self-expression. I wanted a car that reflected who I was too,"
"It really started giving me a level of anxiety," he said, remembering the struggle of breaking down and putting his wheelchair back together again in the past. "By the time that I'd come home at night, I would sit in my driveway for like 15 minutes mentally preparing myself. I just couldn't do it anymore." Now, not only does the MXV fit the young entrepreneur's style, but it easily accommodates his wheelchair too so that he can spend less time and energy breaking the chair down and more time dedicated toward helping others achieve their fundraising goals. "Freedom is really everything. Gaining your independence back...it just opens up your whole entire world."